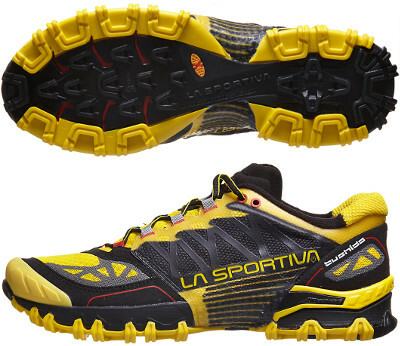 La Sportiva Bushido are neutral trail running shoes. Major new feature in La Sportiva Bushido is the STB Control construction: it is a TPU cradle which embraces midfoot from the bottom providing snug fit and great stability. Upper is made of breathable mesh with several melded strips for improved fit with enough free space for ventilation. As well as other La Sportiva models toebox is rather narrow, so please take it into account when purchasing yours. Outsole is one the greatest features in La Sportiva Bushido with excellent grip on wet rocks but might disappoint on muddy tracks. It not only provides a toe cap to protect against external elements but also a rock plate in the forefoot to defend against sharp objects.